This summer, the first cohort of four Alaska Native summer interns participated in the META Centerâ€™s AORTA program and got to test run an experimental new approach to mentored research. 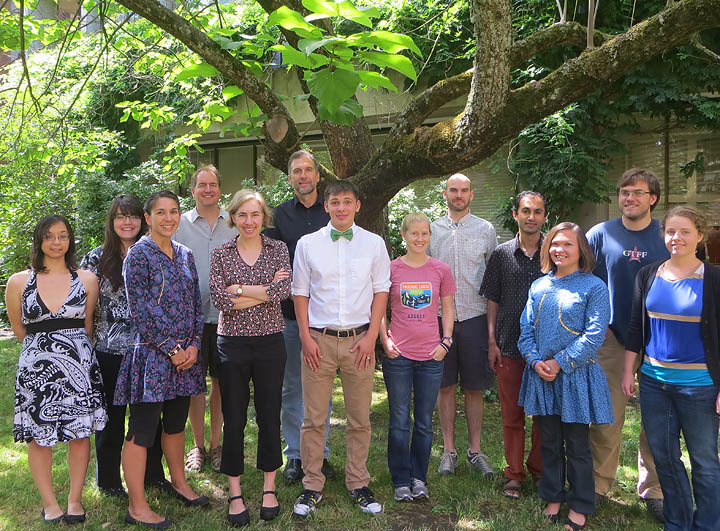 Traditionally, our SPUR summer interns have been individually immersed within labs where they are mentored by a graduate student or postdoc and contribute in some way to that individualâ€™s project. For our AORTA interns, we wanted to give them a more holistic experience of the META Center and expose them to our exciting and cutting-edge technologies and approaches. To do this, we created a research program of microbial discovery that they performed in parallel as a group, which took them through each of the META Center Cores and Hubs of Innovation (Gnotobiology, Live Imaging, Genomics, and Bioinformatics). The students had the opportunity to discover novel fish-associated bacteria, based on different isolation strategies they chose (for example resistance to antimicrobial peptides or heat). They isolated genomic DNA and performed PCR and amplicon sequencing to determine the identity of their novel microbes and performed whole genome sequencing on the HiSeq Illumina platform. They performed microbiological characterizations and discovered interesting properties about their microbes (for example ability to form biofilms or spores). They then learned how to derive germ-free transgenic zebrafish with fluorescently labeled immune cells, which they inoculated with their novel microbes. In these experiments, they characterized the colonization efficiency of their microbes and they used our custom light sheet microscope to image immune cell responses to colonization with their novel microbes. Next they got a crash course in bioinformatics and learned how to annotate their novel microbial genomes. By the end of the summer, each intern had designed and performed a series of independent experiments that tested a hypothesis about the relationship between specific traits of their microbes and the capacity to colonize a host. Collectively, the AORTA internsâ€™ research generated important new knowledge and reagents for the META Center, and it help bring together META Center graduate students, postdocs, and faculty who worked collaboratively on mentoring the interns through their ambitious summer research program. Most importantly, the four interns were unanimously positive about their summer experience in Eugene.